On Tuesday, December 18thAthens Area HS FBLA took 46 students to compete at the Region 27 FBLA Conference at Keystone College. Of the 46 students, 34 kids took Top 3 Awards to qualify for State Competition at Hershey in April. Third Place Awards go to Carter Jones, Introduction to Financial Math; Abby Gifeisman, Cyber Security; and the Hospitality Management team of Leah Reid and Matt Nowacoski. Second Place Awards go to Jesse Sumner, Business Communication; the Entrepreneurship team of Phoenix Jacobsen, Travis Reynard, and Lindsay Testen; the Global Business team of Keegan Rude, TJ Toscano, and Brady Smith; the MIS team of Zach Trasco and Noah Wright; the Sports and Entertainment Management team of Zach Anderson, Lucas Arnold, and David Sheftic; and the Banking and Financial Management team of Maisie Carroll, Brennan Grady, and Isabelle Menard. 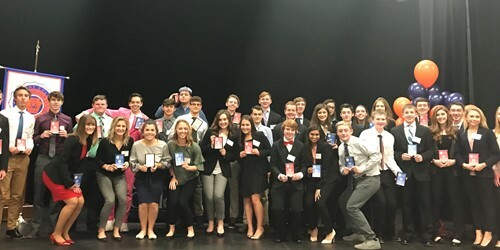 First Place Awards go to Satchel Manchester, Political Science; Aaron Smith, Networking Concepts; Angie Hudock, Agribusiness; Makenna Galvin, Spreadsheet Applications; the Entrepreneurship team of Jack Barrett, Karter Rude, and Ryan Thompson; the Parliamentary Procedure team of Sophie Adams, Ankitha Pamula, Aaron Lane, Meghan McDuffee, and Lara Nasser; and the Sports and Entertainment Management team of Emma Adams, Rachel Hutchison, and Kaden Rude.